ThisInformed: funf: Open Sensing Framework site live, sneak-peek launched! 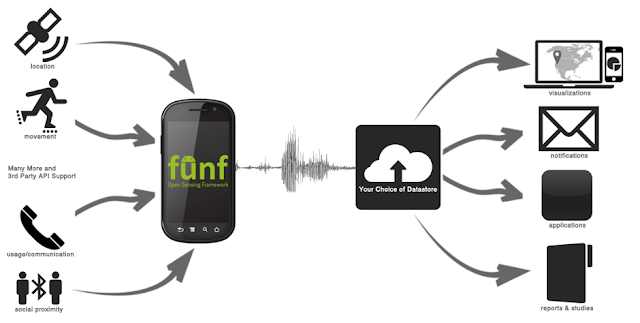 funf: Open Sensing Framework site live, sneak-peek launched! In the Human Dynamics group at the MIT Media Lab, under the direction of Prof. Alex (Sandy) Pentland, we work on sensing, learning, and gaining a better understanding of people and social systems. For the past year and a half I've been point-man on a very large scale and longitudinal experiment, a "living laboratory", or a "social observatory" if you may. The study team includes Wei Pan, Cory Ip, Cody Sumter, Maya Orbach, Yves-Alexandre de Montjoye, Inas Khayal, Sai Moturu, and many many others who have helped out in various capacities through this very challenging year and a half. We equipped members of a residential community with mobile phones that are used as social and behavioral sensors (with participants' informed consent and operating under strict privacy and experimental protocols under supervision of MIT's Internal Review Board, or IRB). We are developing mathematical models to better understand how people and communities organize and operate, and how things like news, ideas, habits, or diseases propagate through a real-world social network. We are also investigating ways to help people make use of the knowledge collected by their mobile phones and aggregate collective data to improve their lives in constructive ways. You can read a bit more about our project and other projects at the Human Dynamics group at this recent Wall Street Journal article ("The Really Smart Phone"), and I'll probably write more about the study and the results coming out of it in future posts. This post however, is dedicated to the underlying Android-based mobile phone software that we developed for data collection and management. We have long wanted to release this codebase as an open framework that would help researchers, developers, and individual self-trackers collect data in an easy and safe way, and leverage the experience we have gained through our field deployments. We recently received a grant through Google Health dedicated for doing just that - opening-up and extending the software platform. There is still a lot of work ahead of us this upcoming summer. We want to implement the lessons we've learned, update architecture, add a whole lot of documentation and tutorials, and many other things needed in the transition from an internal experimental platform to an a configurable, reusable, and extensible sensing framework. We thought that this years Google I/O, Google's developer conference, would be the ideal opportunity for launching our framework and the sneak peek. 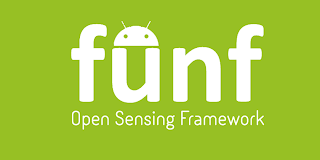 So here we go: World, meet "funf: Open Sensing Framework", currently tailored for Android devices. Check out our freshly minted website at http://funf.media.mit.edu. Nice post which This post however, is dedicated to the underlying Android-based mobile phone software that we developed for data collection and management. We have long wanted to release this codebase as an open framework that would help researchers, developers, and individual self-trackers collect data in an easy and safe way, and leverage the experience we have gained through our field deployments. Thanks a lot for posting this article.